reporting are essential tools for the information security leader, they often fail to translate cyber riskiness into the language of business value. Recently, the Baldrige Program (the folks behind the national award for quality) introduced the Baldrige Cybersecurity Initiative to address the dual challenge of measuring cybersecurity performance excellence and improving communications with executives and the board of directors. Baldrige’s self-assessment tool, the Cybersecurity Excellence Builder (BCEB), is the first nationally-recognized framework for measuring the quality and value of your cybersecurity program. How can cybersecurity leaders leverage the BCEB to evaluate and improve the effectiveness of their cybersecurity program? How does the BCEB relate to other cybersecurity frameworks, such as the NIST Cybersecurity Framework (CSF)? 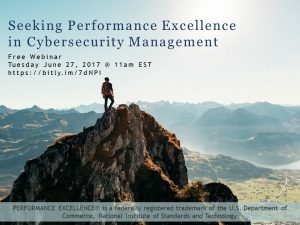 What additional performance improvement resources are available to cybersecurity leaders? Greg Witte, Senior Security Engineer, G2, Inc.